The Fed hawks don’t matter. The doves do! Doubtlessly, the Fed will flip-flop in its elegant manner about rate increases as it has been for over two years, but this time a reliable dove flipped. That itself is scary to the markets. And the reason he mentioned for flipping sent cold chills down their spine. He named one of the biggest and riskiest asset bubbles, commercial real estate. It doesn’t plateau. But it either booms, driven by cheap credit, lots of liquidity, and endless hype. Or it crashes. And he worried that banks and coddled investors, including holders of commercial-mortgage backed securities, will get hit by the shrapnel. When Boston Fed governor Eric Rosengren, a voting member of the Federal Open Markets Committee, where monetary policy is decided, shared some aspects of his worries on Friday morning, markets tanked instantly. This came just after the ECB’s refusal to please the markets with promises of additional bond purchases. Instead, it stuck to the promises it had made previously. What a disappointment for markets running on nothing but central-bank mouth-wagging and money-printing! By the time the ECB’s failure to please and Rosengren’s scary comments hit the trading algos Friday morning, Dow futures had plunged over 100 points. At the end of the day, the record long calm of the S&P 500, lasting 53 trading sessions, got busted viciously to the downside. The index plunged 2.45%, the worst day since the Brexit-vote sell-off of June 24. Bonds got hit too, and yields rose, with the 10-year Treasury yield jumping 6 basis points to 1.67%, the highest since the Brexit vote. The 30-year Treasury yield jumped 7 basis points to 2.39%. In Europe, bonds also fell, with the German 10-year yield jumping 8 basis points and turning positive for the first time since the Brexit vote. Oil plunged 4%, more than wiping out the head-fake rally the day before. No one cares when the Fed hawks squawk about rates being too low, or whatever; they always do that, and that’s why they’re hawks. When it comes to set policy, they’re shoved aside. But when a solid dove like Rosengren squawks about rates being too low and “waiting too long to tighten,” and when he frets about bubbles that could go haywire and do some real damage, suddenly markets break out in cold sweat. He was one of the proponents to raise rates one notch last December, to get the first rate increase over with. In November, he’d fretted about a commercial real bubble in Boston. This time, he fretted about a commercial real estate bubble in the US! First, the economy overheats – the belated tightening might “require more rapid increases in interest rates later in the cycle,” which will likely “result” in a recession, as it did “frequently” in the past. Because commercial real estate is widely held in the portfolios of leveraged institutions, commercial real estate cycles can amplify the impact of economic downturns as financial institutions need to write down the value of loans and cut back on lending to maintain their capital ratios. Not all sectors are still booming: Lodging is down 12% over the past year, health care is down 1%. But strip retail malls are up 4%, office space 5% – which includes some sour grapes, such as Houston’s office market that is sinking into deep trouble – apartments are up 6%, industrial space 7%, and big malls 8%, despite the brick-and-mortar retail woes reverberating through the economy. [T]here are also longer-term risks from significantly overshooting the U.S. economy’s growth – given the bluntness of monetary policy tools, and the possibility of growing imbalances in some asset classes (emphasis added). So not just a bubble in commercial real estate, but bubbles in “some asset classes.” Plural. He didn’t mention the remainder of the asset classes that have gone out of whack and are waiting to deflate, but they’re obvious for all to see and don’t need to be mentioned. This comes with a delicious irony: it took a reliable Fed dove to see these bubbles and point them out publicly, though the hawks should have seen them and fretted about them years ago. Scratching beneath the surface, what I get is this: For Rosengren and folks who think like him, the threat of asset bubbles imploding with devastating consequences once again may be moving into the foreground, regardless of how weak the economic data may be. And there are plenty of reasons to believe that they’ve already waited way too long. the next ‘credit event’ will be a sight to behold !! Too late, it has already happened. The fuse was lit under Greenspan’s too low for too long rates, after the dot com bust. The “credit event ” was delayed. Thus ended the stock bubble. He tried to rekindle the stock markets, but instead blew a huge real estate bubble. It exploded in 2008 taking down the the housing bubble and the markets along with it. Thus ended the stock and housing bubbles. This time it will be the bond bubble that explodes. Taking with it all that remains. ???? – (soon?) bonds, housing and stocks Total catastrophic collapse. however, groups can be surprised when they mostly hope and think alike. back from vacation in the wilds, and i see little has changed. little ever does. They may need to raise soon just so they have something to lower later. Im sure this is on their minds as well. Multi family and warehousing has done quite well, but other commercial property not so much. Sounds a bit sketchy to me. But it stands reason that housing rentals have done so well when you consider that home onership has gone from 69% down to about 63% since 2007. This works out to roughly 7M families more renting since the GFC of 2008. Events will bore as you watch the decay of a large state as it becomes socially inept and economically crippled, a little hollow. The energy is gone even now as the citizens attempt dot the Is and cross the Ts to become a fair society with women and all races represented in all affairs, just like it mattered. Creativity is a pale dream. If you want to see your premise in action, take a look at what FEMA is not doing after the flood in Baton Rouge, Louisiana. After a month they have housed one handicapped person in a trailer, it was for a photo op in the local paper. The debris is still all over the city. They are paralyzed with regulations. Check out the congressional hearing on the matter on Cspan and the local paper, The Advocate. Rosengren shocked and horrified a lot of people with his statement. The truth of which Rosengren speaks IS quite shocking. And what’s even more shocking is to hear such a high-level Fed official come right out and say it. I thought they were supposed to be calming the markets, keeping us in the dark. Like when Janet Yellen herself not too long ago denied bubbles even existed. The Ponzi scheme that keeps our global economy afloat is founded on confidence. Statements like those Rosengren made are definitely not conducive to risk-on sentiment, and that’s the juice that our economy runs on. Knowing full well how his statements would be interpreted, it seems to me like Rosengren has gone rogue, and is telling us point-blank that we’re screwed! In other words, he’s telling it like it is — but in Fed-speak, of course. How shocking! Asset price bubbles are what ultimately derail economies and lead to recessions. Japan is still paying the price for the biggest asset price bubble in history. It’s time central banks stopped focussing solely on consumer price inflation and also included asset price inflation in the mix. It makes no sense to maintain ultra-easy monetary policies when asset prices are growing strongly. It’s the big mistake the Fed made leading up to the Global Financial Crisis. it’s strange how history can repeat so soon after a calamitous recession. There are plenty of countries with real estate bubbles – and in those countries interest rates should be higher. At least then when property prices start declining, central banks have scope to cut interest rates without having to resort to experimental policies (eg negative rates, extreme quantitative easing) which are more likely to make matters worse rather than stimulate growth. At 0, without QE, the fed can still ease. How? By telling the market that it is possible that they might ho tight. The market does not know for sure, so the market holds. Then the fed goes dove, then the market felt “relieved” and become exuberant. It is like threatening your girlfriend that you won’t buy her any new stuff, but later on remove that statement to make her love you more and imagine more without doing anything material. And the market knows and play along. And the market knows that the fed is probably powerless at 0 rate and further QE will trigger monetary confidence issue. It is like a gang of wolves playing along with the top dog who is close to the end. It only needs a trigger to let them eat each other alive. The fund managers know the top dog is weak, but none of them is bold enough to take down the top dog yet. What is wrong with our regulators? 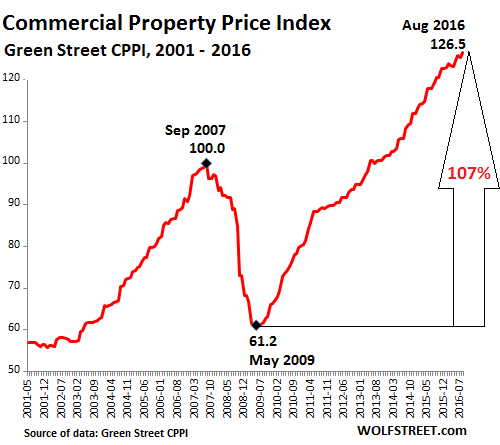 Given the repeated crashes in the commercial real estate market and the economic chaos this causes, why have no steps been taken to control these repeated asset bubbles? It is one thing to make a mistake, but quite another the keep repeating the same mistake. Some palliative measures at the Federal level could include the following, enforced by making loans not in accordance with these guidelines ineligible for interstate/international trading, use as FRB collateral, FRB purchase, tax exempt municipal [economic development] bond financing, or bundling into interstate traded CMBCDOs. (1) Equal amortization of principal and interest over the life of the loan, i. e. no balloon notes or interest only loans. (2) Require fixed interest rates, i. e. no “teaser” rates or ARMs. (3) Limit mortgage terms to reasonable terms, i. e. not to exceed 10 years. (4) Perhaps most impotently, requiring the local permitting/licensing authority to certify, under penalty of perjury, that when existing buildings and currently active building permits are considered, the structure to be constructed will not contribute to “over building” in the particular category (e. g. office building, shopping malls, warehouses, etc.) using the best currently available data and accepted methodology. Will this impact, possibly severely, the incomes of some categories/sectors, at least in the short term? Indeed, but there will be an overall societal cost avoidance, if not saving, if the booms and busts of at least this asset bubble can be minimized. The only way to stop the FED is to wait for it to burn itself out. You miss the point entirely, read what I said again more carefully b/c it was meant literally. You reveal you have a poor comprehension of the circumstances. The FRB is a private corporation with a Federal charter, and is subject to the law the same as any other private corporation. Thus the difficulty is not with the FRB, but the Congress of the United States, which lacks the will and courage to act. Every one of the palliative measures suggested can be enacted into law binding on the FRB, particularly if backed with stiff criminal sanctions for violation. The problem is not that “nothing can be done,” the problem is that “nothing will be done,” largely because we never did anything in the past. Actually I think it is because they are all Frat Bros, Club members, Circle jerk back scratchers, member of SPECTER the squid. Show me ONE person elected or not, that has ‘power’, that has not walked away without ‘enrichment’. When you consider the relationships that Politians and career government personnel have with business and Wall Street, the uber wealthy, the MIC, and cross relationships, ‘they’ are not going to change a damn thing. Go tell a congressman that he must change the law so he can not trade on insider information…start with that one, or close the revolving door from government to industry and visa-versa. No matter if the direction is up or down on anything ( including disease and chaos) that someone connected has the information before you do and will profit. The game plan does not include you or me, if it did none of us would be here posting anything. Perhaps your intuition is your only asset here. Does anyone really believe that anything the FED says has not been transmitted to club members in advance? The other way would be for Congress to get its act together and fix the problem. The Fed was established by Congress, and it can be reconfigured or abolished by Congress. Bank regulatory functions can be transferred to the FDIC, which could also become the lender of last resort (needed to avoid bank runs) – at punitive rates established by law (i.e. 8 percentage points above the 10-year Treasury yield. This would have to come on top of splitting banks from everything else (modern version of Glass-Steagall), to where Goldman can own a separately capitalized bank but cannot be a bank holding company, where banks can only engage in classic banking activities (take deposits, make loans, and process transactions). This way, if Goldman goes, the bank is split out and continues. But as we have seen during the Financial Crisis, every time the Fed is clearly at fault (at least partially) for a massive fiasco, it gets even more power to deal with that massive fiasco in its own manner. The Fed is all about money, and we have the Best Congress Money Can Buy. So I’m not holding my breath. President Obama has rewarded those who have worked to deregulate Wall Street and allow felonious actions to be fined; but with no criminal charges to be brought against those who’ve overseen the commission of the crimes. How the hell does Wells Fargo get away with what they did to MILLIONS of customers? Oh yeah, levy a $185 million dollar fine. Jamie Dimon and JPMorgan Chase? Oh yeah levy a few billion dollars in fines a few times and slap ’em on the wrist. How did he reward Neal Wolin, the man who rewrote the repeal of Glass-Steagall for Bill Clinton in the summer of 1999 after Clinton vetoed the GLB-Act that May? Nominate him to be Timmy Geithner’s right hand man in spring of 2009 just after being inaugurated. Shoot, the guy who opened up the Ponzi-schemes for Wall Street deserved to second in command of the US Department of Treasury, didn’t he? Speaking of Timmy G, remember that the Attorney General of the USA; you know, the person in charge of policing Wall Street’s crimes, should be a Wall Street insider! Bill Clinton appointed Ms. Lynch to prosecute Wall Street for the DOJ in 1999, and that worked so well that she sat on the Fed’s Bank of New York’s Board of Directors from 2003 to 2005 under then Bank President Timmy G.
Alanis Morissette’s ‘Isn’t It Ironic?’ seems appropriate, eh? I agree. Getting rid of Glass-Steagall left banks free to risk their funds in the market. The officers are more interested in the stock price than the health and future of the bank. I can’t help but think that the Fed, Congress, and the bankers all want to keep the scam running until November. I wonder if that is when the crash will happen and the banks begin to fail. Friday was just another warning shot from the markets over the bow of the Fed battleship. “If you raise rates we will take the whole thing down.” Yellen and the FOMC will heed that warning and continue on the course of “uncertainty”. As Wolf quite aptly points out, they’re the best money can buy. The finest legislators money can buy. I remember reading a comment a while ago somewhere about how Rome rotted from the core and eventually burned to the ground from uncontrolled rampant greed, corruption and perversion. That’s the U.S. we live in today and the rest of the world has followed in lockstep like the sheep they all are. There is no fixing this – fixing that to right the ship before it sinks. The only fix is a very painful one that’s been clear as day for over 8 years. People can only hope because hope is all we have left to be able to survive the coming apocalypse. Rosengren was likely sent out for a reason. I think the Fed, trapped as they are, and with jawboning in the traditional sense getting weaker and weaker responses from the market, is probably falling back on one last trick of words- make the market convinced a rate hike is coming at the next meeting in order to maximize the effect when they don’t hike. S&P500 at 2500 by the end of October, and welcome President Clinton a few days after that. Will it work? I don’t know. Has no one at the Fed ever heard Aesop’s fable about the little boy that kept crying wolf and what happened to him? Have the forgotten, or don’t they care? The foundational problem seems to be that the central banks continue to operate in the world of 1913, when mass production manufacturing was the only game in town. The “developed” economies are experiencing the most profound changes since the industrial revolution, not only because of “globalization” (and the rise of massive corporate tax evasion), but automation/robotics (think self-driving vehicles), computerization/artificial intelligence/big data, instantaneous global communications with computer translation (think Ebay), and a host of other revolutionary advances such as genetic engineering and nano-technology. “Wealth” is increasingly represented in new forms such as “intellectual property,” and novel financial instruments such as “derivatives,” and CDOs. they’re going to raise because that’s the prudent thing to do in a world where we have the best house in order. ask me next monday how i feel. Oh gee, the Fed sent out their minions today to calm the markets. Rate rise? What rate rise?